At this point, I think I'll just keep track for fun during this pregnancy. Apologies for the scratched foggy iphone lens. 13+3 ... Weeks plus days the little munchkin in my belly is. Helloooooo second trimester energy. HA! Kidding. Sorta. I'm 1/3 of the way through my pregnancy. What?!? 1 ... Week since I've felt quickening. Please spare me any links telling me otherwise, I know a baby vs a fart. 2 ... weeks since I've been inundated with morning noon and night sickness! PTL! 3 ... number of goldfish I have. I used to have five. One got eaten. One got sucked into the filter. You're welcome. 4 ... days of hacking coughs from my sweet pea. He's so cute when he's sick. When he's not screaming anyway. It's the only time I get snuggles! 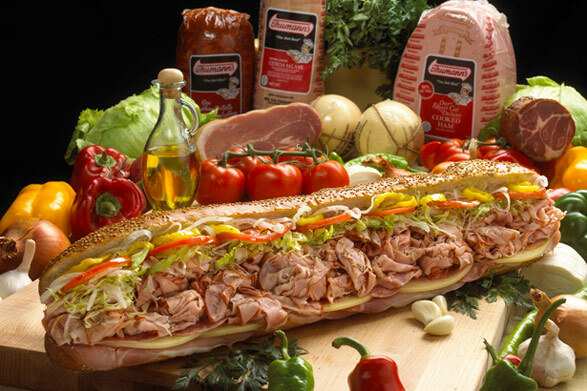 5 ... the number of hoagies I had in the last two weeks until today. 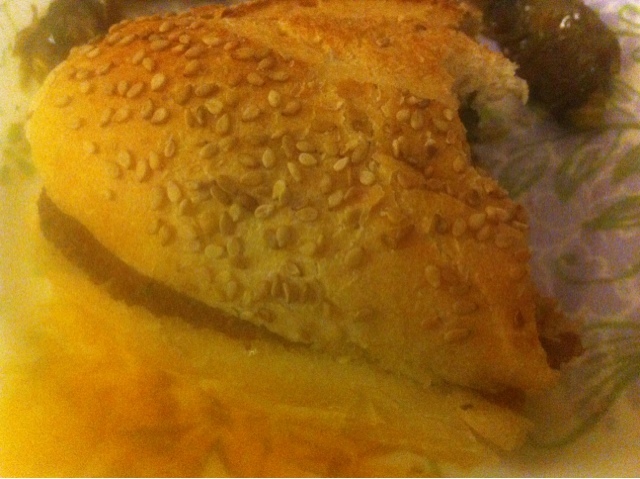 6 ... number of small Veggie Diablo Primo Hoagies I've eaten in the last two weeks including today's. 0 ... number of lbs gained in the last 3 weeks, so don't judge me. Stop judging me. You're judging me. 600 ... times a night I wake up tossing, turning, peeing, or praying for relief from what may or may not be a double ear infection. Stay tuned for that exciting development. Are you judging me yet about those hoagies? They're small. They're mainly broccoli rabe and eggplant. And peppers. Ignore the 1/2 yard of provolone thrown in. And the oil and spices. And the hot peppers so hot it clears the sinuses of the person sitting next to me. Which right now, is no one. And the bread. Oh, the bread. You better not be judging me. It has been 12 fun filled, nauseating, exhausting, food aversion and craving filled weeks since my last blog update. Surprise!! In other news....there is no other news. There's a BAAAAABBBYYYYYY in my belly!! We are thrilled, and when Korban realizes what's going on, I'm sure he'll be thrilled too :) Much like my last pregnancy, I have REDIC food cravings, combined with obnoxious aversions roughly five seconds after considering the craving, leading to lots of leftovers and ginoooormous grocery bills. Hopefully that calms the heck down this trimester. School is the farthest thing from my mind, but it's still simmering away on the back burner. I'm maintaining my GPA, and hoooope I can keep it up by the end of the semester. I'm enjoying (read: rolling my eyes through) my sociology class and leaning on every bit of medical curiosity I've accumulated over the years in my A&P class. Somewhat terrifying fact: I have barely skimmed my A&P chapters due to sheer exhaustion and limited brain CPU's and have aced every test so far. This is because I was raised by a physician and used to read the Physician's Desk Reference and Pediatrics Quarterly for fun. Additionally I took a few weeks of Latin 10 years ago, and these things added to my fondness for reading medical blogs have given me enough of a prefix base to figure out most of the questions. That, and it's open book. Anyway, this means that theoretically it is possible to ace A&P without any real working knowledge of human anatomy and physiology. I'll try not to think of that next time I'm in the hospital. Anyway, here's the best meal I've made in weeks. Not my photo - picture taken from this website. 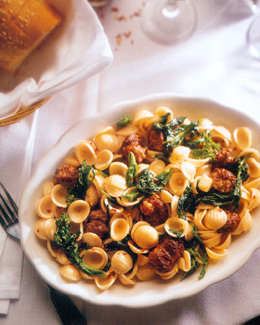 Recipe directly copied from Four Seasons Pasta, no copyright infringement intended. Bring a large pot of salted water to a boil over high heat. Trim the broccoli rabe, removing any tough stems and slicing any stems thicker than a pencil. Add the broccoli rabe to the boiling water, and cook for three minutes until stems are just tender. Using tongs or a slotted spoon, transfer the broccoli rabe to a colander and cool quickly under cold running water. (Keep the cooking water boiling.) Drain the broccoli rabe, squeezing gently to remove excess water, and chop coarsely. Add the pasta to the boiling water, stir gently, and cook until al dente (one minute less than the cooking time on the box recommends). While the pasta is cooking, put the evoo, garlic, and hot pepper flakes in a large skillet. [Important: I Never mince garlic, just chop it, but there REALLY was a taste difference in using minced garlic. I'm sure this isn't news to the rest of the world, but it was news to me! So, throw yourself some gerlics in the Cuisinart and buzz em for a few seconds.] Remove the sausage from its casing, if it has any, and add it to the cold skillet. Warm over moderately low heat, breaking up the sausage with a fork, and cook it until the sausage loses its pinkness. Add the broccoli rabe and season with salt to taste. Stir to coat it with the oil and seasonings. Set aside one cup of the pasta water, then drain the pasta and return it to the warm pot over low heat. Add the sauce and toss well, adding some of the pasta water if it's too dry. Serve immediately with cheese if desired! It. is. sensational. My picky almost-two-year-old had two servings, as did my husband, my baby in utero, and myself. My mom only had one, that bastion of self control, she! P.S. Regarding my last post about Weight Watchers - that was the FIRST call homegirl made after telling family about the new baby. There was never a subscriber happier to cancel. See you in a year, suckerssssss! !